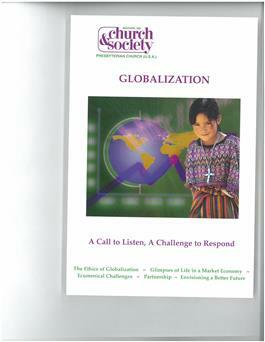 Globalization has been described as a two-edged sword: enriching some, impoverishing others. In this issue, particular focus is given to the PC(USA)'s Joining Hands Against Hunger program and its partnerships between presbyteries and partner churches and NGOs in Peru, Bolivia and Cameroon. Recent ecumenical statements provide a global call to listen and a global challenge to respond in ways that will create a better future for all God's children. Actual shipping charges apply to this order at the time the order is processed. Visit www.pcusa.org/acswp/church-and-society.htm to download magazine covers and tables of content.